It’s Thanksgiving weekend here, and I’m thinking of turkey. More specifically, since Bob is in charge of roasting the turkey, I’m thinking about all the dishes that round out the dinner. Like what to have as a before-dinner snack that won’t be too filling? Shall I stick with my tried-and-true Brussels sprouts with garlic and lemon or try something different? And oh yes, I need to get on with the cranberry relish today so tomorrow will be a little less hectic. Oh the things I daydream about. Also, the gorgeous weather outside is making me want to go out and do something other than putter around in the kitchen. We won’t have many dry, sunny days left in the year, I know. It’s a great afternoon for a slow walk down South Granville street, with a stop for a cappuccino. Okay, let’s cut to the chase then. Here’s an easy, flavorful side dish for Thanksgiving dinner: Sweet potatoes, jazzed up with five-spice powder, fresh ginger and garlic. A touch of butter, salt and pepper and you’re done. This is a case of little things making a big difference. Sweet potatoes (the orange fleshed ones — not to be confused with yams, although all the stores seem to label orange fleshed sweet potatoes as yams around here) are more flavorful than white potatoes and I’m enjoying them more often these days, especially in my quest for crispy oven-baked sweet potato fries. Here, the fresh ginger, garlic and five-spice powder give a lovely zing on the taste buds, and the flavor combination is a natural. So what is five-spice powder? It might not be a staple in your house, but the blend of flavors (typically a mixture of star anise, cinnamon, Szechuan peppercorns, cloves and fennel) lends itself well to marinades and rubs for poultry and pork. Or in vegetable dishes that have a touch of sweetness, like sweet potatoes. This is, hands down, my favorite way to have sweet potatoes now. I’d take this over a plate of crispy yam — I mean, sweet potato — fries any day. Okay good, one decision about Thanksgiving dinner made. Now it’s time for that stroll outside while the sun is still shining. This recipe is so simple that it barely needs instructions. It can be made ahead of time, a quality that's always welcome if you're hosting Thanksgiving dinner for a crowd. This purée also makes a great accompaniment to simpler poultry or pork main courses, like our oven roasted chicken with maple mustard pan sauce. 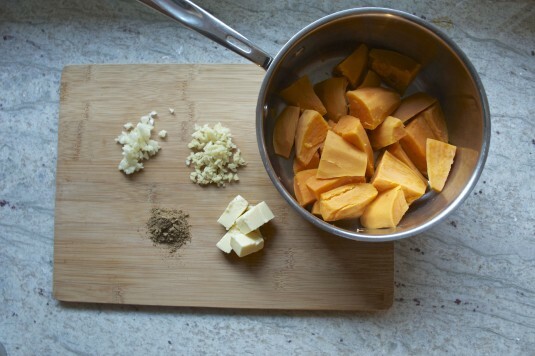 Place sweet potato pieces in a medium saucepan, cover with water and place over medium heat. Bring to a boil and simmer for 4 minutes or until tender when pierced with a fork. drain, and let cool slightly for a few minutes. 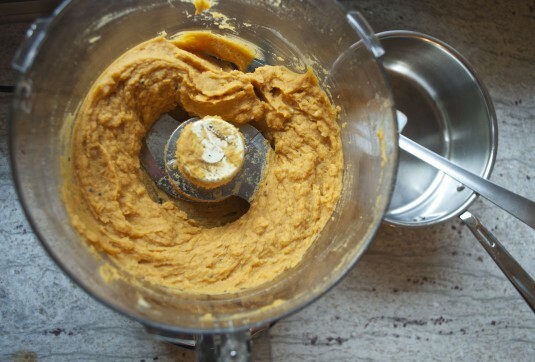 In a food processor with the blade attachment, add cooked sweet potatoes, garlic, ginger and five spice powder, and puree. Scrape down the sides, add butter and puree again until the mixture is smooth. Add salt and pepper to taste. 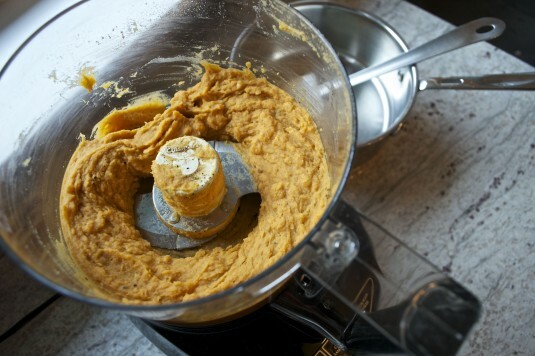 Return sweet potato purée to saucepan and keep warm on low heat until serving time. The sweet potatoes can be made ahead of time, even a day ahead, and refrigerated until you need them. For reheating, warm the purée in a medium saucepan over low heat and cover. Stir occasionally until it's heated through.